A unique consulting process to proactively manage your wealth in order to improve your life, achieve your goals, and have a better future. How should I invest my hard earned money? Do I have the right types of insurance? Is my estate structured correctly? Am I doing everything I can to minimize my taxes? What legacy am I able to leave? We have created the solution you’ve been looking for. It’s a four-step process that gives you the peace of mind that you have full control over your wealth and the confidence that you are maximizing it every way possible. Interview you to bring clarity to your unique situation, your most important goals, your expectations, and your biggest concerns. Complete our risk assessment. We use a tool that will mathematically quantify your risk tolerance. This tool will help us understand your ability to emotionally handle the ups and downs of investing by using cutting edge technology that pinpoints your acceptable levels of risk and reward with unparalleled accuracy. The risk assessment helps us ensure that your portfolio aligns with YOUR investment goals and expectations. Assess our ability to add value to your situation. Schedule The Recommendations Meeting, if appropriate. Verify our understanding of your entire financial situation and retirement goals. Present our recommended wealth planning and investment solutions we believe will help you to achieve those goals. Deliver your Investment Plan. The Investment Plan is our recommendation for the management of your investments and includes a portfolio performance analysis, risk evaluation, asset allocation, assessment of impact of costs, assessment of impact of taxes, and the Investment Policy Statement. Complete all account applications and transfer forms (if applicable) to establish and transfer your investment accounts, so we can implement your Investment Plan. Setup systematic deposits or withdrawals. Establish a meeting schedule for regular progress meetings. 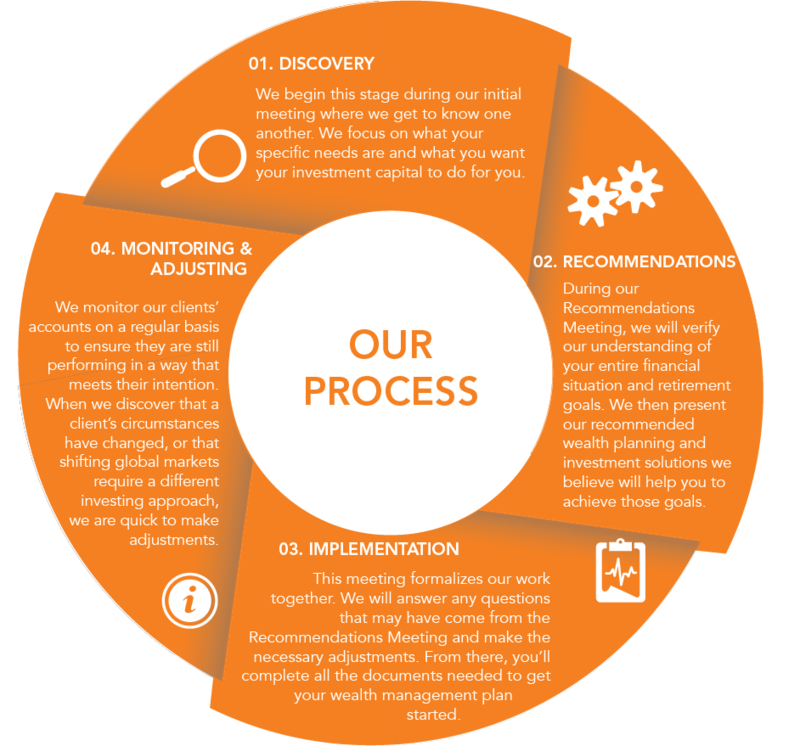 Step 4: Monitoring & Adjusting – We monitor our clients’ accounts on a regular basis to ensure they are still performing in a way that meets their intention. When we discover that a client’s circumstances have changed, or that shifting global markets require a different investing approach, we are quick to make adjustments. We also believe that it’s important to have regular conversations with our clients to review the progress towards your goals. Review your first month’s account statement and your first quarterly report. Review your online Client Web Portal to show you how reports and important documents are organized. Assist with setting up online account view if you desire. Review most recent quarterly investment report, discuss your portfolio, and provide a market and economic outlook. Determine if any changes need to be made to your Investment Plan. Identify important planning areas you’d like to focus on next. Discuss tax mitigation strategies, charitable planning, and cash-flow planning. Discuss wealth transfer issues such as transferring wealth effectively within a family or to a charity. Weekly email updates on the market and economy. Monthly account statements from the account custodian (Fidelity). Quarterly performance report from Hixon Zuercher Capital Management. The report will provide your performance for the most recent quarter, year to date, and since inception. Written portfolio updates delivered quarterly and as needed. In person, online, or telephone investment reviews. We will work with you to set up a mutually agreed upon review schedule. However, clients are encouraged to call us at any time with questions or concerns regarding your account. We are location independent. We are both local and nationwide. While we are based in Northwest Ohio, with the convenience of the internet, we are also able to serve clients who are living, working, and planning for their financial futures all over the country. No matter your location, you will always have the option to meet with us in person or remotely. Getting started is easy. Contact us or call us at 419-425-2400 to begin a confidential conversation about how to begin the process of reaching your financial dreams!